wish to contribute to a balanced view and representation of Turkey and Turkish Canadians in Canada and elsewhere in the world. The congress application is open to youth who are at least 16 years of age and are interested in Turkish heritage and identity in the Canadian cultural mosaic. It is open to any Canadian youth who is willing to participate and provide input towards the objectives of the congress, as permitted by the availability of seats. CTC may be able to offer full or partial compensation for travel and accommodation expenses to those applicants who have demonstrated, or show potential for, outstanding contributions towards furthering the interests of Turkish Canadians in Canada, in line with the stated objectives of the Congress. Participants are expected to demonstrate full and serious commitment to the program as a whole; and attend all the sessions, while also participating in all the activities and workshops. CTC reserves the right to decline financial support to those eligible candidates who have not fulfilled these obligations. Participants of age 16 ? 35: There is no congress fee for these delegates. Financial assistance for travel and accommodation may be provided by CTC. Participants of age 36 and older: A number of seats are available for this group who wish to attend the congress. However, priority for active participation and discussions will be given to the former group. A congress fee of $50 is payable upon registration. The participants cover their travel and accommodation expenses. CTC will make arrangements for shuttles for the congress attendees from Toronto and Montreal (depending on the demand). Travel grants are available at the discretion of CTC for those travelling from farther cities, as indicated below. ? Ontario and Quebec (excluding the Greater Toronto Area and Montreal); up to $100. - Greater Toronto Area and Montreal; shuttle bus ? British Columbia & Alberta; up to $600. ? Elsewhere in Canada; up to $400. The number of seats is limited and there is a quota per region. Approval is based on the evaluation of information provided on the application form and the CV. Accommodations for out?of?town delegates will be at the congress hotel, based on shared occupancy. Please indicate your travel and accommodation requirements in the application form. The conference will begin on the evening of Friday, January 20 with a welcoming reception. Conference presentations will be held on Saturday, January 21. The Youth Panel and workshop will take place on Sunday, January 22. The Conference Banquet will be on the evening of Saturday 21 with a live performance of Turkish musicians. Final program, with more details, will be available shortly. To apply, please click on the link below, and follow the instructions. APPLICATION FORM Deadline for the conference registration is Sunday December 18, 2011. 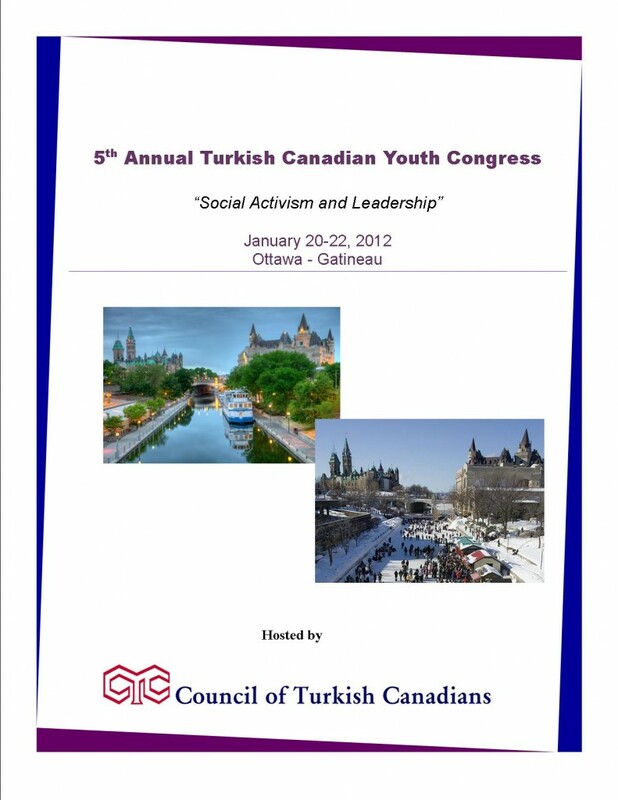 The Council of Turkish Canadians welcomes inquiries and suggestions to make the conference a success for all attendees. Please contact TCYC@TurkishCanadians.com for your inquiries and suggestions.